Two Chinese and Rumanian national rob lakhs by fixing gadget at spot where ATM card is inserted ... and recover password! 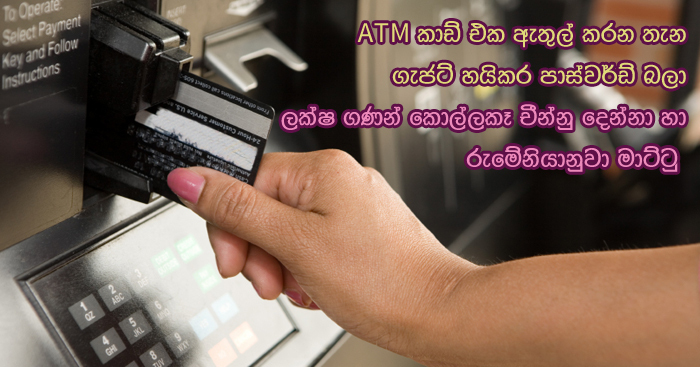 Three suspects responsible for incidents of robbing cash from ATMs in areas such as Rajagiriya and Kalubowila have been taken into custody by police. It was revealed that the three of them are of foreign nationalities and they have robbed the money by tracking data of the pin number on credit cards and debit cards with the aid of an instrument inserted into the magnetic strips of false cards and have thus used them on ATM cards. affixed by them to the opening where the card is inserted and that particular part at first glance gives the impression to the consumer that it actually is a part of the machine itself, since it is so attached. It is also said that there is a method whereby the before-mentioned pin number is relayed to the mobile phone of these racketeers. In this way, they have resorted to extract lakhs of rupees by inserting the dummy cards with the pin number they have secured. Two in this group are Chinese while the other is a Rumanian, it is reported. These two Chinese nationals were cornered in Chatham Street, Fort and Wellawatta and the Rumanian was nabbed in Panadura, police inform. With the suspects there had been over Rs. 12 lakhs of cash and a tools used in this 'game' plus close upon 200 cards. The three of them have been sent to remand prison by now.